Don’t roll! 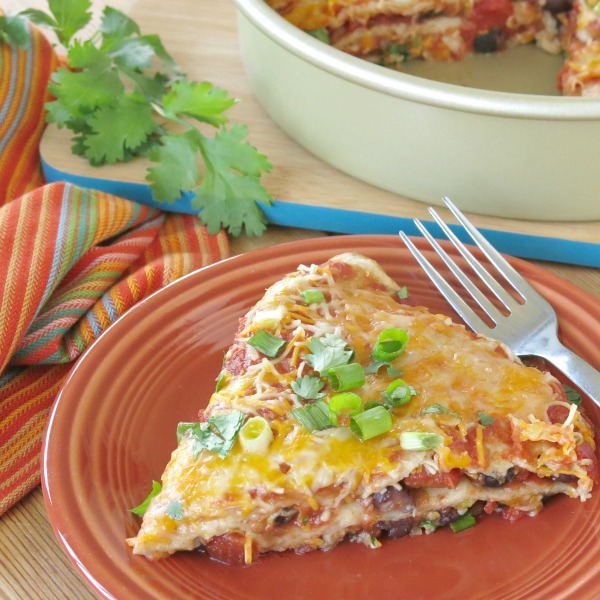 Make Stacked Burrito Pie Casserole instead. Layer your favorite Mexican ingredients 3 layers high and bake. It’s that easy! 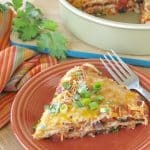 This burrito casserole recipe is a close relative to our Layered Chicken Enchilada Casserole. In both cases, it’s a matter of layering ingredients in a pan and then baking it until hot and the cheese is melty. These dishes were very popular at our make-ahead meal assembly kitchen. 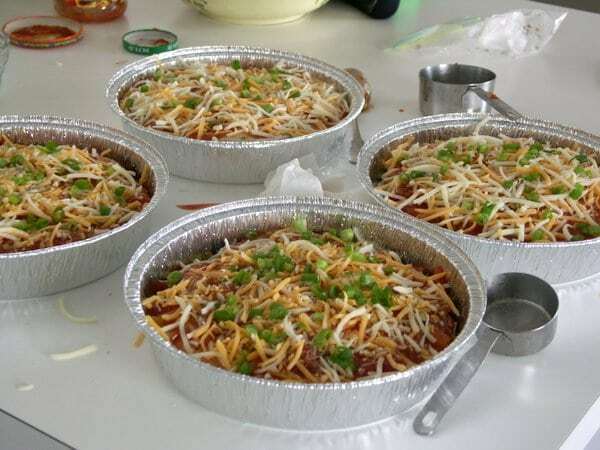 Customers would lay out several pans and then customize each one, adding meat to some and leaving out cilantro on others. Make ahead tip: While you have all the fixings out, make extras and freeze them for later. You’ll be glad you did! It’s best to prepare all of the ingredients first and then set up an assembly line. All prep can be done the day before! Prepare tomatoes – I usually don’t have time to chop the quantity needed. So, I use tomatoes from a box or can. Prepare Black Beans. Rinse and drain. Prepare salsa – any type will work, including a fruity one like peach or mango or make your own homemade chunky salsa like Sugar-Free Mom. I usually have beef crumbles ready to go for my hubby! I make the crumbles in bulk and store them in 1 cup portions in the freezer. Frozen crumbles can be added to the layering process if they are not clumped. Vegan shreds to make this recipe dairy-free and vegan. Use an 8 or 9 inch round cake pan or aluminum tin for a circular pie shape. Or, use a standard 9 x 13 casserole dish and overlap two tortillas for each layer. Double ingredient amounts. If this method is used, it’s best to cut serving pieces in squares. Let the assembly begin! Check out the steps below or the video below. Suggested amounts are given for each layer. Eyeball it and or adjust based upon personal preferences. It’s hard to mess this up. I make 2 vegetarian pies with extra cheese, a pie with crumbles and a vegan version! Start with a flour tortilla as the bottom layer. 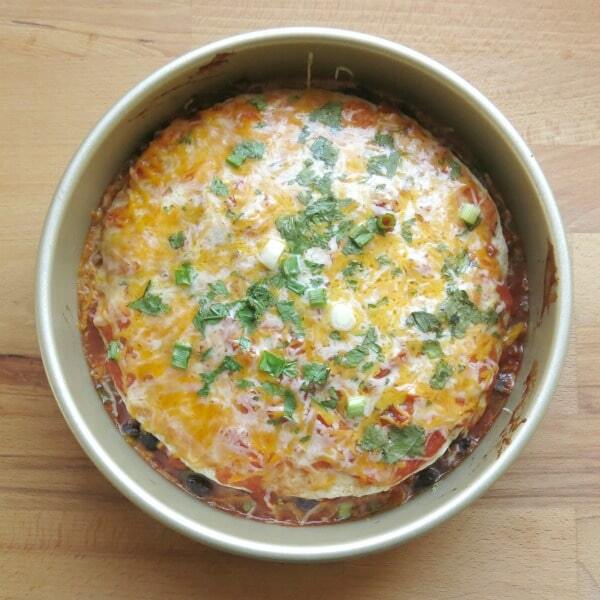 Layer, salsa, black beans, tomatoes, cheese, green onion and cilantro on top of the first tortilla. Additional ingredients as desired, such as crumbled beef, tofu or microwave corn on the cob, etc. Put the second flour tortilla on top. Place the third flour tortilla on top. At this point, I usually need to gently push down the contents so everything will fit nicely in the pan! Top with a little more salsa and cheese. Bake Burrito Casserole Pie in the oven at 350 degrees F for about 30 minutes or until heated through. Also, make sure to wait about ten minutes before serving so it has time to set. Top it off with a dollop of sour cream…or guacamole dip and enjoy! Once assembled, place aluminum foil over the pan and store in the freezer. Enclose in plastic wrap too and be sure to label what’s inside! Or, before assembly, line the pan with aluminum foil first. Assemble and freeze for about an hour and then remove the pie from the pan and freeze the burrito casserole in just the aluminum foil. Return to the same cake pan when you are ready to defrost and cook it. When ready to enjoy, defrost in the refrigerator overnight and then follow the cooking instructions. Ahhh…admire the accomplishment. To many this is a terrible mess…to me, it’s dinner for several nights! Your favorite burrito ingredients are sandwiched between four tortillas stacked 3 layers high. Spread 1/3 cup salsa over the first tortilla. 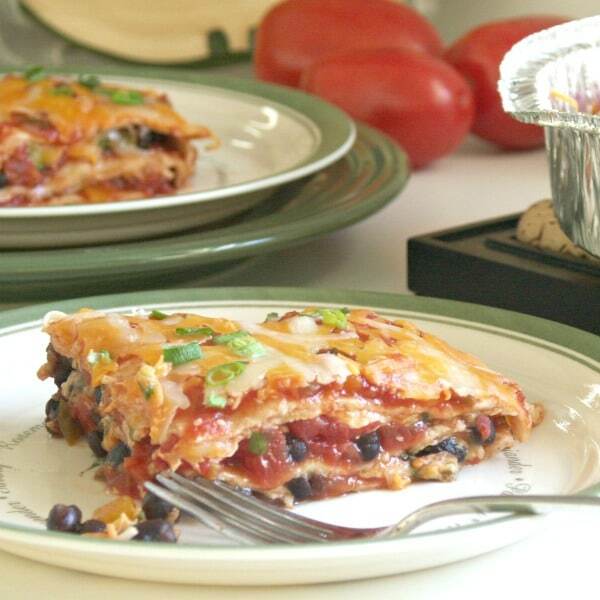 Layer 1/2 the black beans, 1/2 the tomatoes tomato, 1/2 cup cheese on top. Sprinkle 2 Tablespoons of cilantro and 2 Tablespoons green onion on top. Layer the second flour tortilla on top. Repeat steps 3-5 to create the second layer. Layer third flour tortilla on top. Spread remaining salsa and cheese and green onion on top. Allow pie to set for about 10 minutes before serving. Serve with toppings such as sour cream and guacamole. This dish freezes well. Once you have assembled the pie, cover with aluminum foil and wrap in plastic wrap. Be sure to label the pan. Store in the freezer for about 2 months. When you are ready to enjoy the dish, allow it to defrost in the refrigerator for about 24 hours first. This is so awesome, and just in time for Cinco De Mayo! What a great idea, stacking it like that! YUM!!! This is my kind of meal!!! What a great make ahead meal option! Even the kids can get in on the assembly action. I think I”m going to make this for a family I know who have a new baby! Thanks for the idea! I really love that each family member gets their own personal pan. That would definitely be a hit in our house! 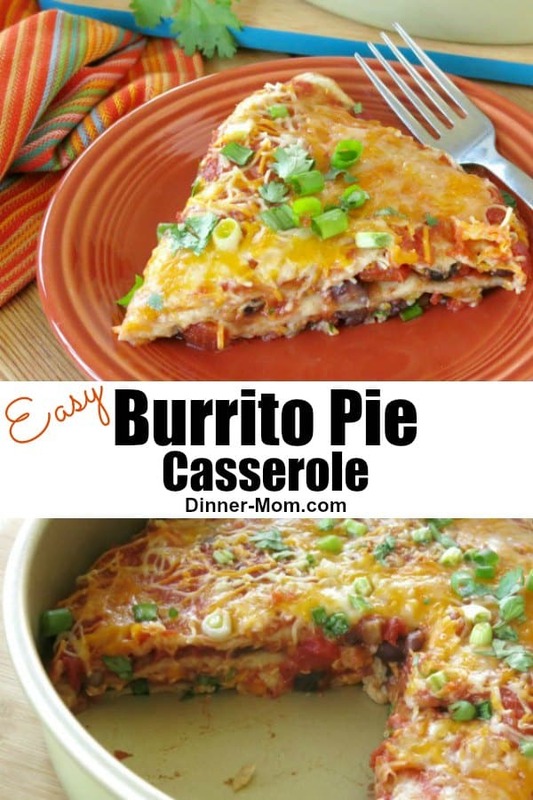 Love that you can really customize this burrito pie with anything the family likes! 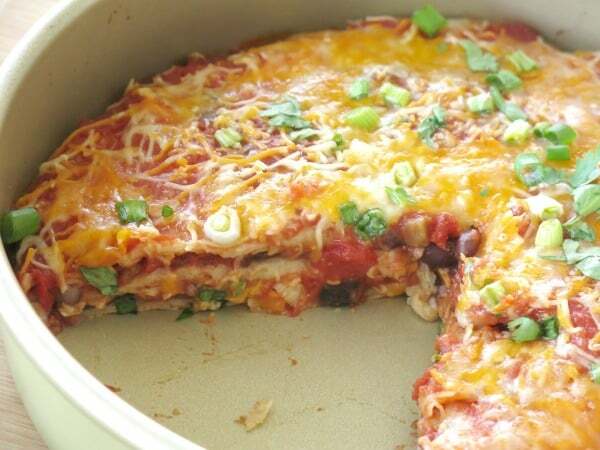 Great idea to freeze ahead too for quick weeknight meals! Such a great idea – both to make each family member their own – plus extras to freeze for a quick reheat when time is tight! This would be sure perfection for a kids party where they could customize their own. Great recipe and photos. Holy yum! I love all these layers of flavor! Oh my! I can’t believe how easy it is! Definitely comfort food for me on lazy days. 😛 can’t wait to try it. I’m thinking this would be great with our favorite peach salsa. What a good looking stack of flavors! I’ve totally got to make these and stock the freezer with them! Made this all the time at your store and it was always delicious! And freeze well. We made it for a party so we could have a variety of versions and it was a big hit. Hi! Glad to reconnect! Thanks for your comment! Sounds so tasty! I love that it can be prepped ahead and then frozen….great for those busy nights when you don’t have time to prepare a meal, and it’s perfect for taking to a friend who just had a baby or maybe is too ill to spend time preparing food. Thanks! It’s perfect food gift for a friend!!! I made this for supper on the weekend and everyone loved it. So good. Thanks for the recipe. I”m so glad you enjoyed it!